In early February, Senior Program Officer for Africa, Theodoros Chronopoulos, and Program and Evaluation Officer, Caitlin Mitchell, visited 7 grantee partner organizations in South Africa. 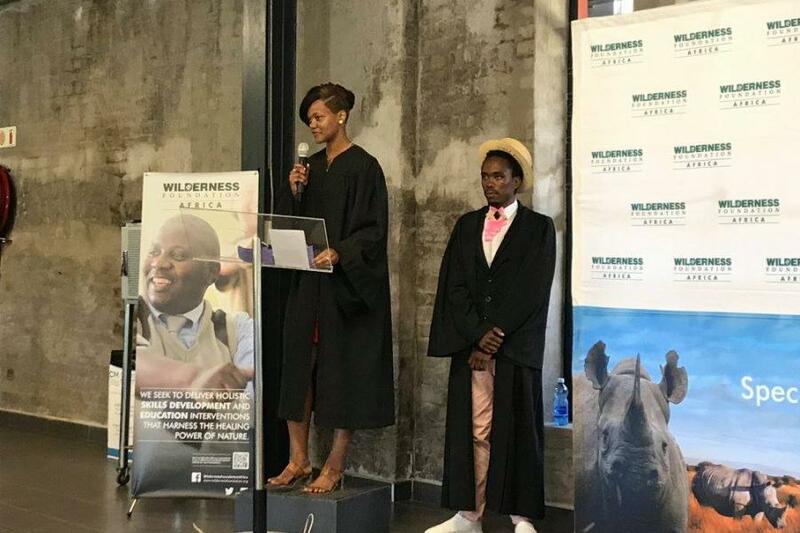 On the first leg of their trip, in the Eastern Cape, they visited United Through Sport and Wilderness Foundation Africa, and had the pleasure of attending the graduation ceremony for Wilderness Foundation’s latest cohort of participants from the Siyazenzela Livelihoods Program! This program, like many others EMpower supports in Africa, equips participants with employability skills that make them stand out in the competitive job market. During the graduation speeches, Siyabulela Finca (24), expressed the transformational impact WFA’s program has, as he told the audience: “When I started this program, I was depressed, broke and broken. Wilderness Foundation changed all that.” It was remarkable to witness the confidence and drive that this program has allowed these young people to discover. The highlight of the trip for Theodoros was visiting the Launch Pad established by Homestead (a child and youth care centre) and Mamelani to help young people transition to independent, adult life. This was a project he had spoken to Mamelani about 4 years ago, when it was just an idea. Now, the Launch Pad is a safe place where youth aged 15-16 are transferred to, enabling them to live in town and get support in preparation for their transition to independent life. For Theodoros, witnessing this concept flourish into reality, and in such a short space of time, was incredibly moving! The site visits that followed were to The Sozo Foundation and Amandla EduFootball’s Safe Hub, the latter located on the border of Gugulethu and Manenberg townships. Theodoros and Caitlin were fortunate to hear from Siphokazi Ndlangalavu about how working for Amandla has allowed her to become a role model for young people in her community, including other single moms. Hearing directly from beneficiaries and staff really puts into perspective the impact our grantee partners have, often beyond what we expect. Theodoros and Caitlin were given the opportunity to sit in a session when visiting Realistic, where participants discussed their struggle with substance abuse, and celebrated each other’s achievements, an integral aspect of these sessions to help motivate each other in the pursuit of positive life paths. After additional visits to Ithemba Lethu Learning Center in Langa Township and Waves for Change, Theodoros and Caitlin’s visit ended with a feeling of appreciation, to have met with and heard from so many of the beneficiaries, program graduates and dedicated staff. To see photos of EMpower’s program visit to South Africa, click here!